This is the third in a series of posts examining various components of the Republican replacement plans for the Affordable Care Act (ACA). It’s here. The Republican plan to replace the Affordable Care Act. Bottom line assessment? 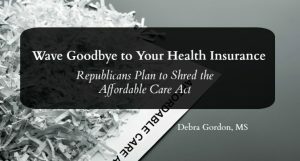 If you like the health insurance you have today you can say goodbye to it tomorrow, particularly if that insurance comes thanks to expanded Medicaid programs or a federal subsidy. 1. Scraps the individual mandate; adds a penalty. Currently, all Americans are required to have some kind of health insurance or pay a penalty. This ensures that healthy people buy into the system to help offset the costs of sick people, a requirement if you also mandate that insurers cover those with pre-existing conditions without jacking up the price of the insurance. Under the new plan, you don’t have to have insurance. But if you don’t, and then you try to buy it, the insurer can charge you a 30 percent penalty. Which, of course, makes it even more expensive and less likely you’ll buy it. It also represents a boon to health insurance companies. 2. Keeps the pre-existing condition mandate. The good news is that if you have ever had a serious medical condition or are dealing with something now (think asthma, heart disease, cancer, diabetes, depression, etc.) insurers still have to cover you. They also can’t charge you more based on your pre-existing condition. The bad news is that this will kill the individual market. You can’t require insurance companies to cover individuals with pre-existing conditions and not charge them more than healthy people (guaranteed issue) unless you also require that everyone have health insurance (the individual mandate). Otherwise, you don’t have enough premiums from healthy people needed to offset medical claims from the sick. 3. Kills subsidies, offers tax credits. About 86 percent of the 12.1 million people who get their health insurance on the individual exchange get a subsidy in the form of a tax credit pegged to their income. In 2015, The New York Times reported that the average subsidy was $263 a month and reduced premiums by an average of 72 percent. Say goodbye to those! Under this plan, you’ll get a tax credit of between $2,000 (for those under 30) and $4,000 (for those over 60) pegged to your age, not your income. As this article notes based on a Kaiser Family Foundation analysis, a 60-year-old with an income around the federal poverty line would see her tax credit cut from around $10,000 to $4,000, while a 27-year-old earning more than $75,000 would get a new $2,000 tax credit. Right, now the average monthly premium for individual health plans ranges from $153 for a bare bones catastrophic plan to about $500 for the richest plans. The cheapest full-benefit plan costs an average of $315 a month, or about $3,600 a year. You do the math. Oh, and the bill eventually phases out those credits, so don’t get used to them. 4. Closes the purse strings on Medicaid. Thirty-one states and the District of Columbia expanded their Medicaid programs to allow anyone whose income was up to 138 percent of the federal poverty level to enroll. In return, the federal government promised to pay for the expansion (100 percent until 2019, 90 percent thereafter). This provided coverage for 10 million people. This plan slams the door on that expansion. After 2020, states don’t have to enroll able-bodied adults and the feds stop paying for the already existing expansion. Instead, the plan essentially turns Medicaid into a block grant program, meaning the feds will give each state a lump sum of money to do with what they want. Even Republican governors are up in arms about this. There’s more. The proposal allows the sale of insurance across state lines (read my blog on why this won’t work); eliminates the taxes to pharmaceutical and medical device companies that helped fund the ACA; defunds Planned Parenthood; allows dependents up to age 26 to remain on their parent’s health insurance; and increases the amount you can sock away in a health savings account (more on HSAs here). Those of you with employer-provided health insurance, stop looking so smug. The bill repeals an ACA requirement that employers offer affordable plans that cost no more than 9 percent of an employee’s gross income. It also eliminates the ACA requirement that large employers (those with more than 50 full-time employees) offer health insurance to their employees. We have no clue how much this will cost because the House didn’t send the proposal through the nonpartisan Congressional Budget Office (CBO). In January, the CBO estimated that repealing the law would increase the number of uninsured by 18 million in the first year. After funding for Medicaid expansion and subsidies were eliminated, that number would increase to 32 million by 2026. The January report didn’t address the impact on the federal deficit. But a 2015 CBO report estimated a repeal would increase the deficits by $137 billion between 2016 and 2025. The bill goes before two House committees this week. It promises to be an ugly fight, so stay tuned. Newer Why Does an MRI Cost $2,500 Here and $250 in Finland?